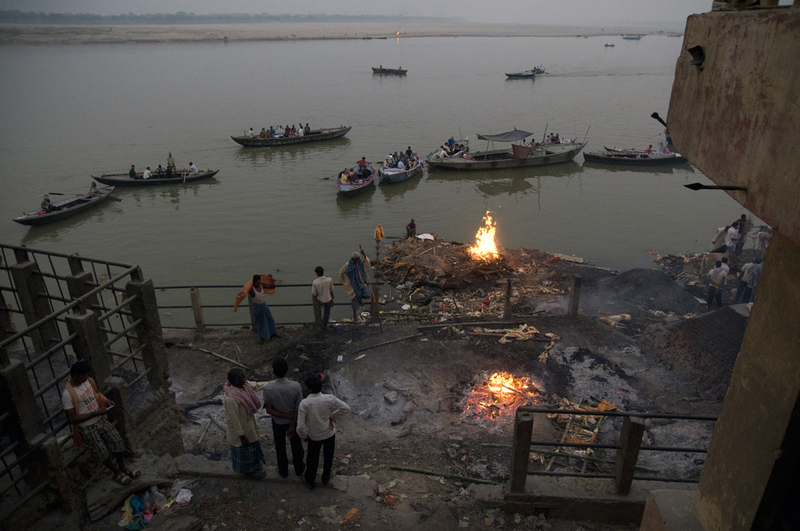 The holy city of Varanasi is a special place to die because a cremation in its burning ghats, as per Hindu beliefs, liberates one from the cycle of life and death. 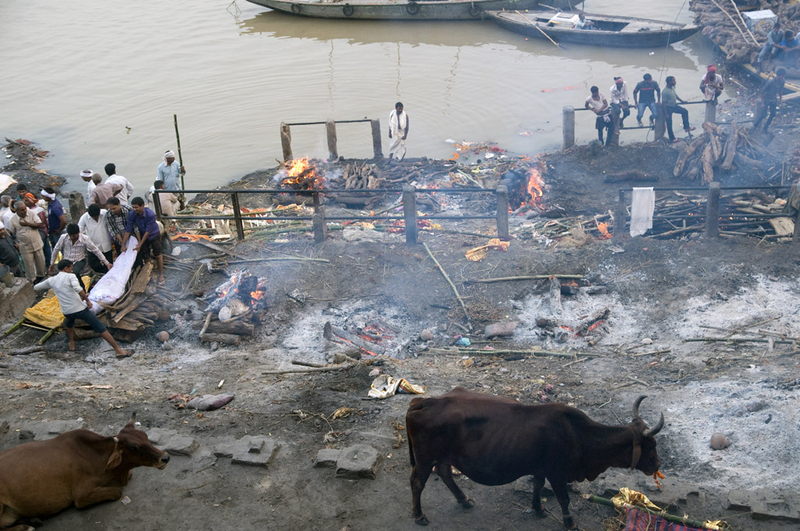 A large number of dead bodies are brought to Varanasi everyday from far off places to be cremated at the Manikarnika and the Harishchandra ghats on the bank of the Ganges River. The custodian of these sacred grounds is the Dom community. They are also the keepers of the sacred fire, from which the funeral pyre must be ignited to free the soul of the dead from the death-rebirth cycle. A fraternity of about 500 people with a hereditary chief (called the Dom Raja) as the chief cremation undertaker, they are the guardians of the dead in Varanasi. The Doms are entrusted with this task of carrying out a devout Hindu’s final ritual, yet they are “untouchables” and cannot touch an upper caste Hindu. 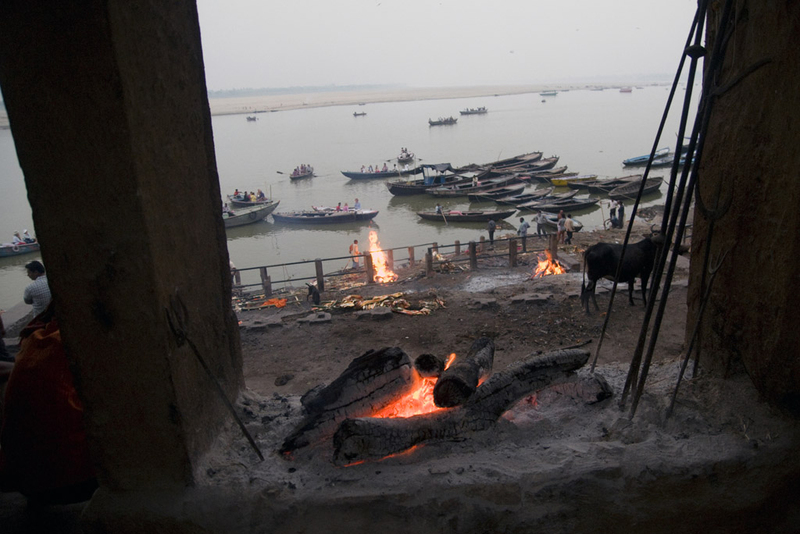 In fact, outside the premises of these two burning ghats, they are looked down upon as members of the lowest sub-caste. This custom has made it extremely difficult for them to take up a profession other than that of cremation undertakers. Most of the Doms are financially quite well off, as the charges for cremation are arbitrary and quite exorbitant (although the community often charges only a nominal fee from the poor). 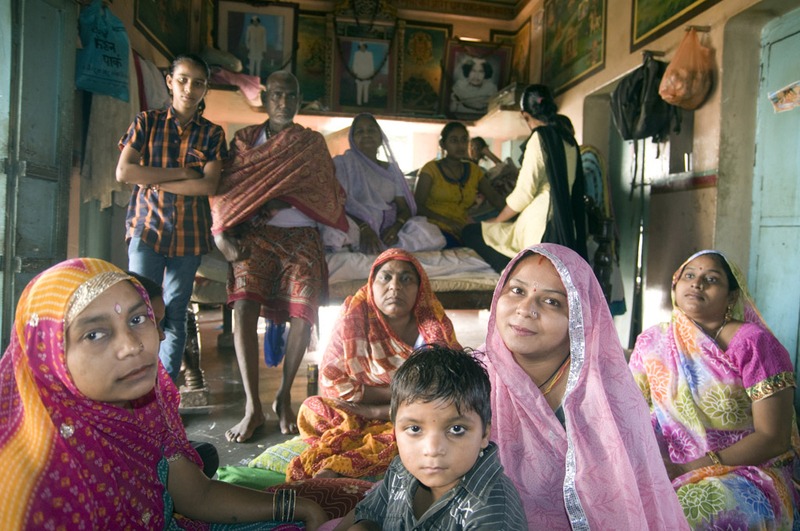 The hereditary chief is a multimillionaire and lives in a palatial mansion overlooking the Ganges in Varanasi. However, like the 500 members of the community he leads, he remains an “untouchable” to society at large. Many of the Doms want their children to enter into other professions and hope that a change in outlook will bring about a change in their social status, and they will be free of this “untouchable” tag someday. 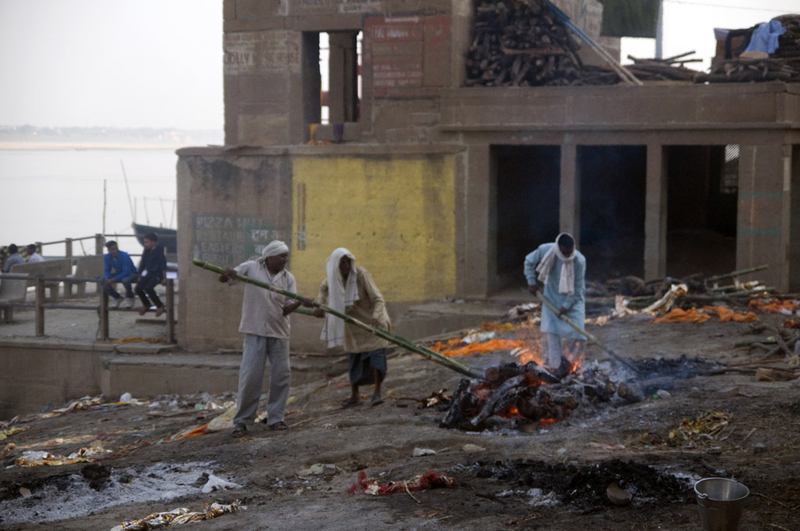 A dead body wrapped in white cloth is being laid by relatives and the Doms on Manikarnika ghat for the cremation. The Doms are allowed to touch a member of an upper caste only when he is dead. 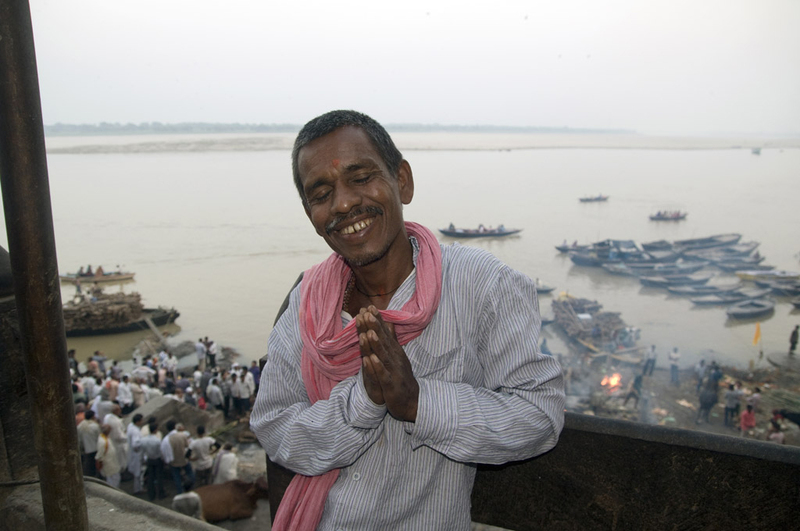 Bhim Chowdhary is one of the 500 strong Dom fraternity of Varanasi. 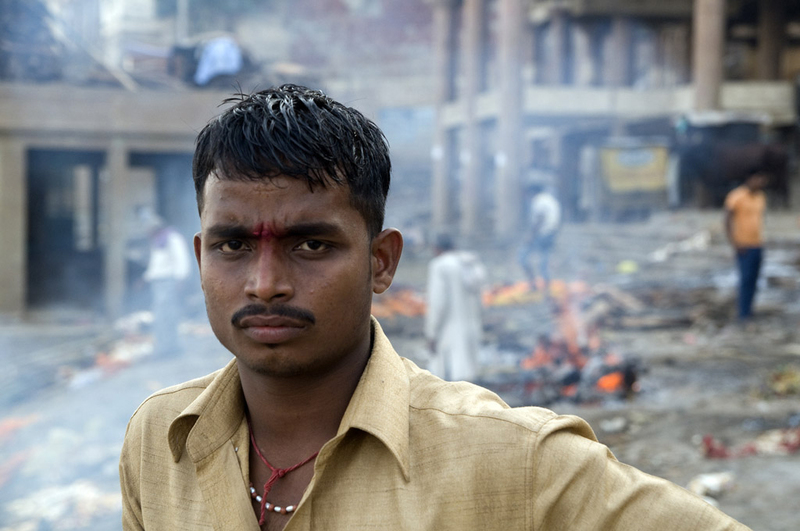 He feels at home in the cremation grounds, where he has been working since his teens because outside the premises of the burning ghats, he is a social outcast. Barku Chowdhary wanted to leave his community profession but he says that being an untouchable, it was not possible to set up the small shop he wanted to. 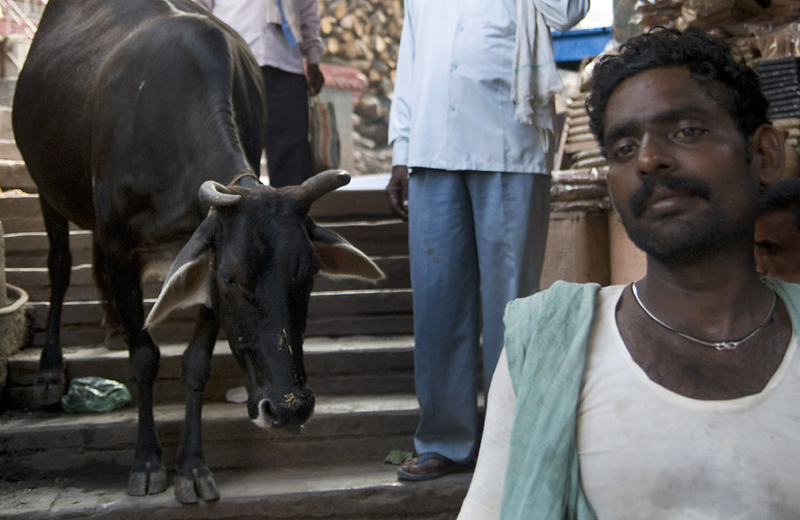 He now works as a Dom in Harishchandra ghat but wants his son to be a teacher. 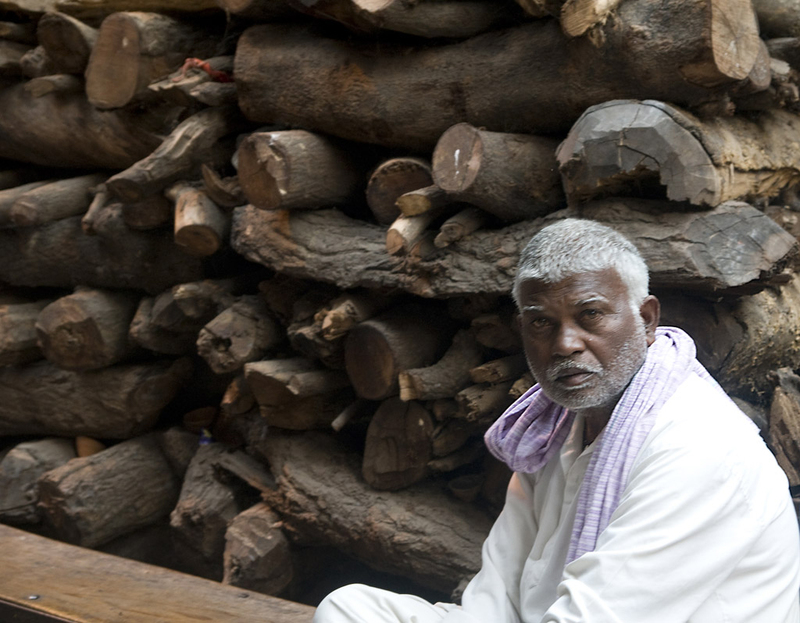 Madhu, 62, is an upper caste who partners with the Doms in the firewood trade in Manikarnika. But he says that he cannot touch or eat with the Doms as it will render him an outcast in his community. 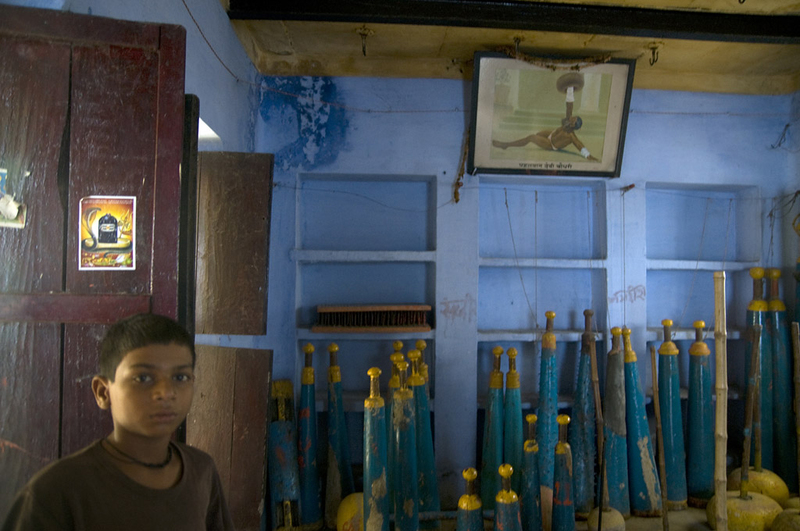 Bishen has been working as a Dom for the last two decades in Varanasi. The earning is good, he says, as the Dom charges for the cremation rites are arbitrary and often exorbitant. But he is tired of this living off the dead and of being branded an "untouchable." 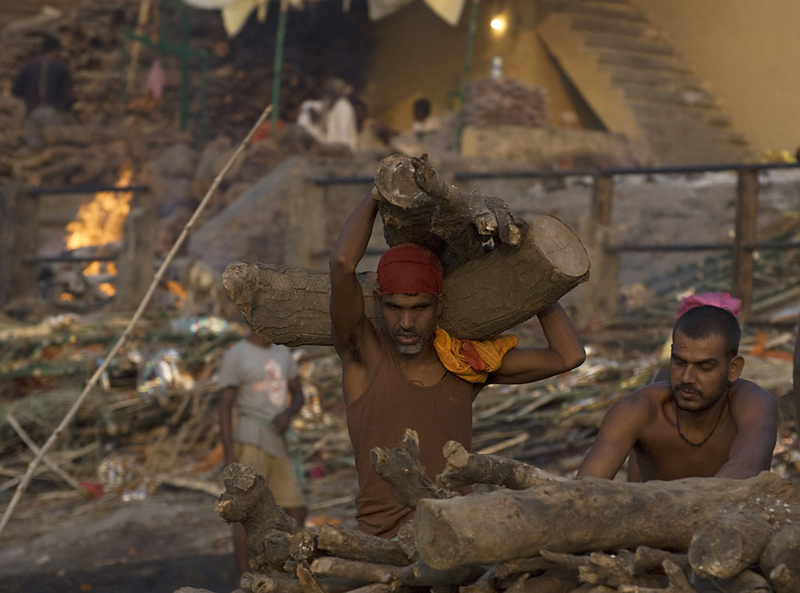 A trio of Doms working at the pyres with their logs at Harishchandra ghat. 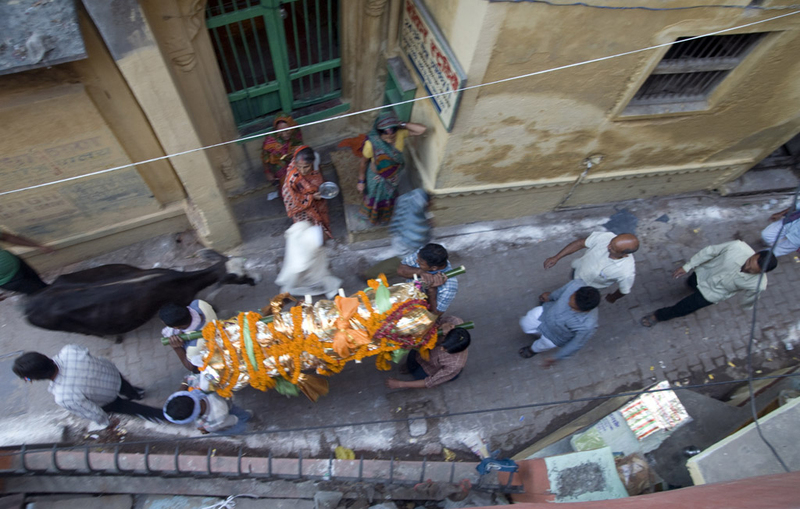 Pall bearers carrying a shrouded corpse through the serpentine lanes of Varanasi towards Manikarnika, the ghat of death. 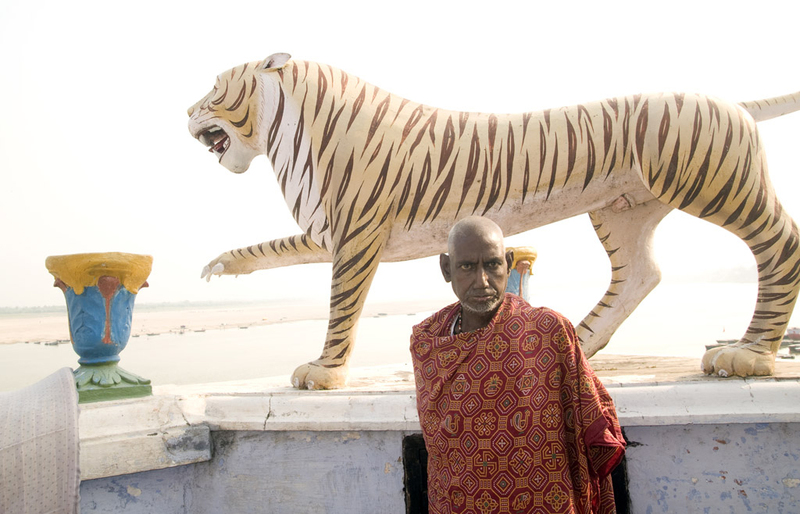 Sanjit Chowdhary, the present hereditary king of the Dom, on the terrace of his mansion overlooking the Ganges in Varanasi. He is a multimillionaire but like every other member of the fraternity he leads, is an “untouchable” in society. Vikas, Sanjit Chowdhary’s nephew, in their family gymnasium. He wants to be a police officer when he grows up. The family members of the Dom king in their centuries-old mansion. The holy flame of the Dom at Manikarnika, which, according to legends, has burned unextinguished for centuries. The funeral fire must come from this incandescent pit owned by the Dom community. Dusk gathers over the Ganges as funeral pyres laid out on Manikarnika blaze on under the watchful eyes of the Doms, the guardians of the dead. India is once again holding the world's largest religious festival. But not everyone is here to worship.